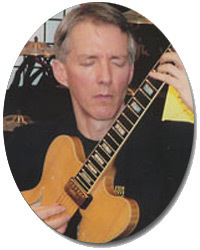 John Stowell began his successful career in the early 1970's with guitar lessons in his native Connecticut from guitarist Linc Chamberland and from pianist John Mehegan, a respected jazz educator at the Juilliard School of Music and Yale University. Several years later he met noted bassist David Friesen in New York City, and they formed a duo that recorded and toured prolifically for seven years, with performances in Europe, Canada, the United States and Australia. The duo continues to perform thirty years after their first meeting. In 1983 John and David Friesen joined flutist Paul Horn and Paul's son Robin Horn for a historic tour of the Soviet Union. This was the first time in forty years that an American jazz group had been invited to play public performances in Russia. In 1993, 1995 and 1998 John returned to Russia, playing in numerous cities. His two sold-out performances in Kursk may be the first appearances there by an American jazz musician. John continues to tour, record and teach internationally. He has been Artist-In-Residence at various schools in Germany, Indonesia, Argentina as well as in the United States and Canada. He also served as assistant director and performer in Oregon Public Broadcastings's PDX Jazz Summit in 1991, and since 1995 has been a contributing columnist to a number of magazines, including Downbeat, Guitar Player, Canadian Musician, Soundcheck, and Guitar Club. The purpose of this book is to give the serious student an entry into the creative process as quickly as possible. Presented here is all of the necessary information, stated clearly and simply as possible, so that motivation and inspiration will soon follow on the heels of comprehension. Some of the topics include: pentatonics and arpeggios, substitution using triads, pick and fingers technique, dominant 7th chords, using major triads to extend dominant 7th chords and major 7th chords. John Stowell Plays "How Deep Is The Ocean"
John Stowell is known internationally as a musician with a unique approach to guitar supported by a sophisticated harmonic concept. John has been performing solo guitar concerts for over thirty years and has captivated audiences all over the world. This DVD captures an intimate performance of his original compositions in the same format as his solo concerts and demonstrates John's daringly original approach to improvised music. This collection of original compositions allows the listener to follow the development of John's ideas and organizational principles, both creating progressions of chords and creating progressions of colors and rhythms. In his compositions John often succeeds in reaching a point where the goal, as composer Paul Dukas put it, is not to create dissonances but "make multiple resonances vibrate". The combination of John's interesting compositions and enjoyable and inspiring performances make this a unique opportunity to experience both composed and improvised ideas from a master musician! Songs include: "Behind the Scenes, Fret Less Blues, Friendly Giant, Fun With Fruit, Ghost in the Corner, Haiku, Heres or Theres, I Wish, Laughing River, Lonely Blue Angel, Social Butterfly, Stay Right There, The Big Chair, The Great Escape, When Jasper Grows Up, Wybleing." John Stowell Plays "Laughing River"